With the purpose of supporting the definition of the Science and Technology Strategy 2011 – 2020 by the Ministry of Science and Technology of Vietnam, a novel approach to policy and strategy development was introduced, combining foresight techniques alongside traditional strategy programming tools. This novel approach is considered useful for application in developing countries with strong planning traditions. Vietnam has one of the fastest evolving economies among developing countries. GDP growth was around 7% in the last decade and should continue growing if the country moves beyond the current model based on low labour costs and intensive capital investment. In spite of advances, strengthening competitiveness and productivity presents a key challenge. In social terms, poverty decreased from 58% (1993) to 14% (2008), indicating the capacity of the country to achieve the Millennium Development Goals. There remains, however, a large and increasing income gap. Advances in education and health have been important, but problems of coverage and quality associated to the services provided also remain as challenges. Recognising the importance of science, technology and innovation (STI) as instruments of development, Vietnam has given them high priority and has defined and implemented corresponding policies and strategies for several years. The process followed an approach consistent with the country’s political context, i.e. based on a strong planning culture, a top-down policy approach and weak monitoring and evaluation systems. The outcomes of this approach have been mixed. Demanding policies and strategies were defined but had a varying degree of success in terms of extent and quality of implementation and impact. Recognising the challenges imposed by today’s accelerated technological change, the growing complexity of research and innovation, and obvious limitations of traditional approaches used in policy and strategy formulation, Vietnam requested support from UNIDO to formulate the 2011/2020 STI strategy and better meet its development goals. Responding to the above request, the project developed and applied a novel approach to policy and strategy definition by using foresight as a focusing and policy informing tool, aiming to support, step by step, the preparation of a fully-fledged national STI strategy (UNIDO 2010a) and facilitate the institutional embedding of the foresight and strategy process. Very few cases of foresight exercises are known to focus explicitly on the future shaping of the whole STI system. The application of the novel approach to shape the STI system requires its components and functions to be explicitly identified. On this basis, it is of crucial importance to ensure, first of all, an effective and efficient operation of the STI system in structural terms (“structural priorities”). More specific priorities can only be tackled if the main STI system functions operate properly. A second element playing an important role in the context of the definition of policy and strategy are three types of thematic priorities on which to concentrate efforts beyond structural ones: key science domains, technology areas and application fields. A third element concerns time. Any policy or strategy should target a given time frame, and the targets defined within this horizon should be both challenging and achievable while steps towards defining them need to be clearly defined. Finally, foresight and STI policy strategy development should be embedded in a comprehensive framework of policy definition. Foresight activities with the purpose of exploring the future development of the STI system at the national level and for specific key technologies, combining exploratory and normative approaches, and devising options and roadmaps for future action. STI strategy propositions to “translate” the findings of foresight into position papers that can be easily fed into the development and formulation of the actual STI strategy. In turn, insights generated in the context of the STI strategy can be fed back into the foresight exercise. 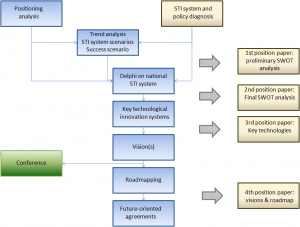 In this approach, foresight activities and the development of the STI policy and strategy are closely intertwined, as shown in Figure 1. In this phase, the relative performance of the STI system is analysed, a preliminary SWOT analysis constructed, and the main current policies and strategies assessed in order to capture the country’s present situation. This phase also explores trends related to contextual local and international developments and drivers that are likely to affect the country’s STI system in the coming years; from these trends and drivers, first exploratory scenarios can then be constructed. On top of these exploratory scenarios, a so-called “success scenario” needs to be developed in order to obtain a first normative orientation and a set of criteria to determine what a desirable future for the country’s STI system might look like. The success scenario also provides the basis for specifying criteria for the selection of technology areas to be analysed in more depth later in the process. The result of this phase is resumed into a first informing “position paper”, which is then fed into the strategy team. The second phase deepens the exploration of the STI system by way of a Delphi enquiry, which is used as a means to interact extensively with the expert and stakeholder communities and to collect further inputs and feedback on three main aspects: a) the trends identified, b) the exploratory and success scenarios developed for the STI system together with their main structural characteristics and deficits, and c) main technology areas of importance to the country. The Delphi can be implemented in four main blocks: a) scenario assessment and perspectives on success in STI, b) national and international context of the STI system, c) structural challenges in the STI system and d) potential technology areas. As Delphi surveys are difficult to carry out in many developing economies, other types of consultative foresight techniques may be used as alternative options. The assessments from the Delphi can then be analysed and interpreted in the light of the currently envisaged objectives and targets of the national development plan and strategy in order to trigger a debate to what extent there is actually the systemic capacity in place to achieve what has been formulated as targets. This phase serves as the basis for preparing a second position paper to provide a deepened SWOT analysis of the STI system, together with first views on possible technology areas to focus on in the next module. This phase takes a limited number (5-6) of promising technology areas as its starting point. Based on suggestions from the second position paper and close interaction with the STI strategy drafting team, these areas can be defined with a view to achieving important socio-economic development goals. Apart from identifying and assessing key technologies in these areas, this analysis aims at exploring the systemic requirements that the area-specific STI systems in which these key technologies are embedded have to meet in order to ensure their successful development and application. The key technology (4 to 5 per area) analysis can be based mainly on panel work and possibly on interviews with additional key experts. Depending on a country’s specific situation, criteria for the selection of key technologies could be, for instance, their relevance to industrial application and to the positioning of the country in international production networks, the relative strength of the country in this key technology or the potential to become an autonomous leader in this key technology as contrasted with being dependent on critical imports. This phase moves from the analytical and exploratory perspectives adopted in the previous phases towards a more normative perspective on what a desirable future of the STI system could look like, and what steps may be needed to get there. The panels established in the previous step develop visionary outlooks for the key technology innovation systems they have been dealing with. Building on the insights on requirements for key technology innovation systems, they sketch how these systems should look like within a given time horizon. Similarly, a previously established crosscutting panel should work on a vision at the level of the STI system. Some harmonisation of the different visions is achieved by a joint workshop of the different panels because the STI system visions should build on sector visions and the sector visions should be framed by the STI system vision. The different visions can finally be compiled in a single document. A final and fourth position paper can then be prepared to feed the visionary and roadmap-related elements into the policy and strategy development process. The final phase of the process deals with the conclusion of concrete agreements between actors and stakeholders to undertake specific joint action in line with the STI policy and strategy developed. This phase is already about making first steps towards the implementation of the strategy. Phase 1: A STI system and policy diagnosis was obtained (UNIDO 2010b), and a trend analysis and scenarios completed (UNIDO 2010c). A first position paper informed the strategy drafting team on the main results of this phase, emphasising the internal trends and challenges to Vietnam. Phase 2: A Delphi inquiry was conducted by e-mail, which received little response and was not used for further analysis. This situation restricted the exploration of key technology areas and technology innovation systems to be undertaken in Phase 3, but did lead to their discussion in the strategy panels as reflected in the first draft of the strategy prepared by the Ministry of Science and Technology of Vietnam (MOST) in mid-2011. Considering the above limitations, position paper 2 put its emphasis on exploring the possibility of realising a success scenario and provided guidelines on how to achieve it. Further considering that a draft strategy had already been developed by this time, position paper 3 provided inputs that would allow to better embed it into the Five-year National Development Plan (NDP) (2011–2015) that was being prompted for approval. Position paper 4 identified key STI inputs needed to advance prioritised economic and social sectors, based on a set of priorities put forward in the draft version of the STI strategy of September 2011. The main idea of this position paper was to ensure that the STI strategy would be embedded in the NDP, drawing on the “vision” that had been constructed as part of the latter. MOST adopted the STI Strategy in April 2012 with some of the limitations that were characteristic of previous strategies, such as its still too general character and lack of more specifically targeted priorities. Nonetheless, the novel approach to policy and strategy definition introduced in the project did incorporate several elements of importance into the final version of the document. The social and economic developments that have taken place in Vietnam in the past years have provided a facilitating framework for a novel approach to STI decision-making, combining foresight tools with traditional programming methods. The rather strong cultural context for policy definitions in Vietnam has limited the full application of the adopted methodological approach, but the process served as a powerful learning technique in the institutions dealing with policy and strategy. Because of the complexity in the definition of public policies in fostering and strengthening indigenous capabilities to use, adapt, modify or create technologies and scientific knowledge, a parallel foresight and policy design process seems to be one of the most promising approaches to improve decision-making processes in developing countries.